Elementor integrates with the free version of HubSpot completely automatically. There are a few steps you should make to make the integration even better. Before we go into more details, make sure you have embedded the HubSpot tracking code on your site. You can also use the HubSpot Tracking Code for WordPress plugin. After logging into HubSpot, go to Settings > Marketing > Collected Forms and make sure 'Collect data from website forms' is switched on. 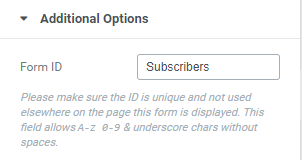 Edit your form, and under Additional options > Form ID, set a name for your form. This is done so the form submission can later be recognized on HubSpot. 2. Enter testing details into the form, and click on submit. You should see a confirmation message. If there is an error with the integration, and you are logged into the site as admin, you will see the description of the error, so you know exactly what went wrong with the integration. 4. Now, log into your HubSpot account and go to Marketing > Lead Capture > Collected Forms. Make sure the form name for the form you just submitted appears in the list. 5. To view the new contact that was just submitted, go to Contacts > Contacts. That contact will now be monitored by HubSpot. Note: Hubspot only allows collected form integration for its free plan. It will not work for paid Hubspot plans.